A monument commemorates Captain Charles Sturt`s exploration of the River Murray in 1830. 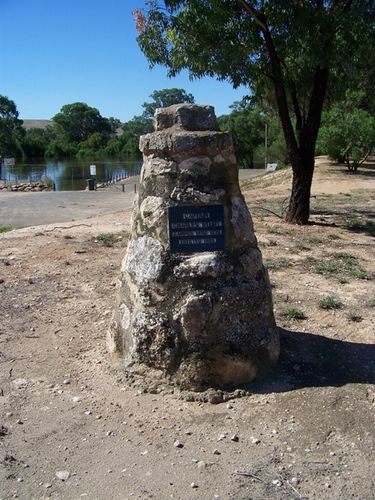 A cairn was originally erected in Murray Bridge in 1930 to commemorate the centenary of Sturt's voyage. Captain Charles Sturt and his crew rowed a whale boat down the river in 1830 to see where the westward flowing river went. They explored the large river which was named River Murray by Captain Sturt. Where Sturt Reserve is now is where the party camped on the 8th of February 1830. The group was disappointed when they reached the mouth of the river as they saw it would be too difficult for ships to navigate because of the sandbars and the unpredictable Southern Ocean. Rowing against the current, Sturt’s crew wearily returned. His report suggested the Murray Valley ideal for settlement. Captain Charles Sturt camped here 1830.